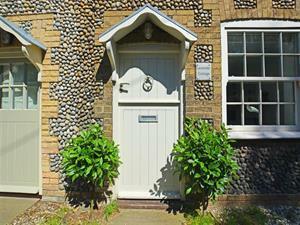 Lavender Cottage01263 715779work01603 870304fax Self-cateringA traditional Norfolk flint property, Lavender Cottage is a charming holiday home with a stylish interior and a landscaped hidden garden to the rear planted with box hedging, lavender and beech affording a private space. Originally built in the mid 1800's and set in the heart of the pretty village of North Creake, you will be delighted the moment you walk in through the stable door. The cottage is decorated in neutral and soft blue-grey hues, has a comfortable sitting room with a wood burner for those colder days, a well equipped kitchen and a conservatory/dining room, with French doors to the garden. The first floor is accessed via a steep Norfolk winder staircase typical of this part of Norfolk and has two bedrooms with king-size beds and a bathroom. There is plenty to do in the area; this particular stretch of the north Norfolk coastline is designated as an Area of Outstanding Natural Beauty and is within easy reach, offering lovely sandy beaches at Brancaster, Holkham and Wells-next-the-Sea, great for stretching your legs and the dog's too! Sailing and cycling, kite flying and farmers food markets can all be found in this region. The RSPB reserve at Snettisham is a short drive away, there is golf at Old Hunstanton and the sophisticated village of Burnham Market has an eclectic mix of fashion, interior design, food and art shops that will easily while away a day's browsing. A traditional Norfolk flint property, Lavender Cottage is a charming holiday home with a stylish interior and a landscaped hidden garden to the rear planted with box hedging, lavender and beech affording a private space. Originally built in the mid 1800's and set in the heart of the pretty village of North Creake, you will be delighted the moment you walk in through the stable door. The cottage is decorated in neutral and soft blue-grey hues, has a comfortable sitting room with a wood burner for those colder days, a well equipped kitchen and a conservatory/dining room, with French doors to the garden. The first floor is accessed via a steep Norfolk winder staircase typical of this part of Norfolk and has two bedrooms with king-size beds and a bathroom. There is plenty to do in the area; this particular stretch of the north Norfolk coastline is designated as an Area of Outstanding Natural Beauty and is within easy reach, offering lovely sandy beaches at Brancaster, Holkham and Wells-next-the-Sea, great for stretching your legs and the dog's too! Sailing and cycling, kite flying and farmers food markets can all be found in this region. The RSPB reserve at Snettisham is a short drive away, there is golf at Old Hunstanton and the sophisticated village of Burnham Market has an eclectic mix of fashion, interior design, food and art shops that will easily while away a day's browsing.